Nathan P. Gilmour , 31 May 2016. Now that we’ve got a descriptive account of human existence in place, we’ve got the basics of how human beings, as beings in the world, come to relate to different sorts of realities, be they ready-to-hand equipment for the things we do day to day; realities that don’t immediately lend themselves to our smooth functioning; and other human beings, who present the intellectual challenge of existing as beings-who-know-me. But none of these, so far, really gets at the realities that we tend to call religious, and so Macquarrie dedicates a chapter to the possibility of revelation before turning towards a philosophical account of God and whether that’s possible. Macquarrie’s is the standard English translation of Martin Heidegger’s Being and Time, so I found little surprise in the fact that he starts with Heidegger’s notion of truth. In Being and Time Heidegger draws on the compound-word character of aletheia, the word that translators of the New Testament and of Plato often render as “truth” in modern English. Heidegger notes the root verb lanthano, to forget or to ignore, and interprets truth as a process of helping another person or one’s self to un-ignore the reality before us. I’ve heard more than one Classicist express concerns with that etymology, but the image is evocative even if the roots of the etymology don’t go quite as far back as Aristotle. The important thing here, though, is that Macquarrie articulates the difference between reason and revelation in terms of initiative: in normal reasoning, the human being takes the initiative to undergo the truthing process, while in revelation the initiative for aletheia lies beyond the human being (86). Such is the logic of revelation, and Macquarrie offers several words of caution as he works out the implications of that shift in initiative. To start he warns against attempts to “get behind” faith to arrive at certitude (88). When some reality beyond the human individual approaches, the only options we human beings have is to interpret the phenomenon: whether we say that a revelatory moment is a hallucination, a delusion, an act of communication analogous to conversations between people, a symbolic manifestation of realities beyond our intellects’ possibilities, or whatever else, what we’ve got is a narrative account of those realities, and when we “debunk” or “disbelieve” the same, all we can do is match interpretations to interpretations. What that gives us is not a notion of general revelation but a framework within which revelation is universally possible but not guaranteed beyond the experience (89). Such a distinction, though, should not steer us into relativism or a too-easy scientism. Human beings are historical, contingent critters, and such contingency means that some revelatory moments are primordial, leading to coherent intellectual traditions and the possibility of repetition (90). By repetition Macquarrie does not mean identical instances of an event but the sort of traditional reading and re-reading that make Hinduism and Islam and Christianity different sorts of traditions from religious movements whose origins are much more recent or which must be reconstructed after centuries of abandonment. Repetition, in this religious sense, means to think-again with a text (92), the sort of event that has pre-Christian roots to be sure but reaches its flower, in the Abrahamic traditions anyway, in the work of Rabbis and preachers and Imams. Do You Really Have a Personal Relationship? Macquarrie’s section on the philosophical possibility of revelation begins with a critique of a trope that seems prescient even though I know the concepts go back as farther than 1977, even as the catch-phrases seem very contemporary to me. Evangelicals might talk about a “personal relationship with Jesus,” but liberal Protestants talk about an “I-Thou” relationship with God. Macquarrie’s main problem with both formulae is that each treats God as a being among beings (93), a move that threatens to shift religious discourse into mythological modes that will not hold up even under medieval philosophical examination, much less sound in harmony with the vision of the world as the modern sciences of physics and astronomy and biology render it. On the other hand, religion cannot be merely an outgrowth of cultural norms, as some of religion’s cultured despisers like to tell the tale. Historically, religious human beings have time and again demonstrated themselves capable of critiquing entire societies, their own societies, as unjust, and that move does not stand possible if religions are capable only of reflecting and replicating their cultures’ moral norms (96). Further, religious awe, as an atmospheric phenomenon, does not easily reduce to a psychologically-flat sense of one’s own smallness or to mere gaps in scientific theories (100). Instead human existence itself, when described in rigorously phenomenological terms, seems disposed to something that one could reasonably call reverence or worship. Since the response to Being seems possible in an array of cultural contexts, Macquarrie wonders whether the question “Does God exist” might be an atheist question at the outset (101), a response to phenomena towards which the questioner has already refused reverence. 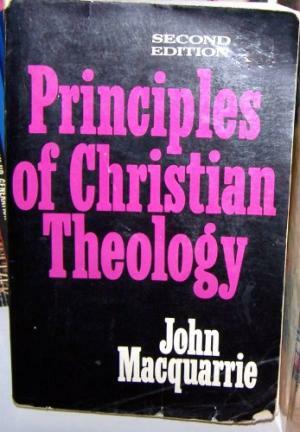 Maquarrie is careful to note, at the outset of the fifth chapter on Being and God, that “being” is not simply a synonym for God. That’s not what Heidegger was after, and since Macquarrie’s project in this part of the book is to provide a descriptive philosophical framework for the sake of digging into theology proper in the next part, he is cautious about jumping the gun and starting to talk about God as if that category were universally available, irrespective of particular tradition and particular revelation. Moreover he cautions against a religion that has no content, a generic list of feelings that refers neither to Shiva nor to Qur’an nor to Holy Spirit (105). Nonetheless, he does maintain that Being, which he capitalizes when he refers to the human sense that Being is holy as well as philosophically important, might be a precursor of sorts for the particular claims of Christian theology. Speech about Being is not objective (106), which would render Being merely a being among beings (107), but neither do claims about Being stand as subjective (106), which would make religious claims at best private and at worst delusional. Being is not merely a property common to all beings (108), so Being as he discusses it does not simply undergird the other realities that philosophy treats (109). Being is not an all-inclusive being, after the manner of pantheism, nor a single, supreme being as certain mythological renderings of God would have it (110). Whatever human beings say about Being, the latter transcends even our capacity to imagine one being over all other beings. I’ll admit that, at this point in the book, I was wondering what would ever become of my Exodus-four test, the theological exercise that I undertake when theologies get too abstract: does YHWH in fact become angry, in a way that YHWH was not angry before, when Moses makes excuses for his inability to go to Egypt? If not, is the problem with Exodus four or with the systematic theology? That said, since I’ve not finished this book, I’ll withhold my suspicion until we get to the sections on the particulars of Christian confession and Christian Bible. Being differs from becoming: Being encompasses all things that come to be or cease to be, but that which encompasses does not itself become otherwise (111). Being differs from appearance: one’s encounter with the transcendent outstrips what our senses can apprehend and does not stand as illusion (111). Being differs from ideal: our visions of how things ought to be, whether in terms as simple as the true equilateral triangle or as complex as truly just community, stand in relationship with Being but are not identical with the same (112). Having negated some bad ideas about Being and put Being into relationships with some opposites, Macquarrie makes the move that I like best in this chapter, to say that Being does not exist. Of course, part of my joy in that move resides with my sense that the right sort of people would find that claim offensive. There’s no point in my pretending to deny that. But beyond my petulance, I like the fact that, as Macquarrie frames a universally-accessible concept of Being as transcendent, he holds that Being is not a being that might or might not exist but posits of Being that Being lets-be (113). That’s not a claim of Epicurean apathy or Deistic absenteeism but an assertion of Being’s utter incomparability: whereas beings exist or don’t, Being allows beings to exist, makes possible that any given being might exist. I’ll admit that my main concern at this point is nothing that Macquarrie has written but what, within this framework, a theologian might actually do with the content and the particularity of the Biblical witness. I suppose such explorations remain to be seen.